They say it’s the journey, not the destination that counts, but why not go for both? The two-hour drive to Valdez takes you through canyons, past glaciers and over a mountain pass, and at the end of it is a beautiful coastal village with plenty to offer. 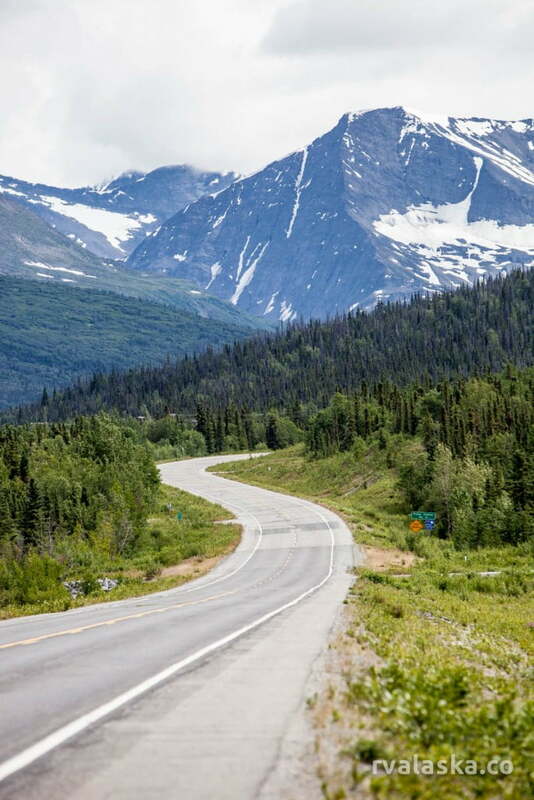 The beginning of the 120-mile route from Glennallen has views to the east of sweeping plains giving way to the Wrangell Mountains in the distance. 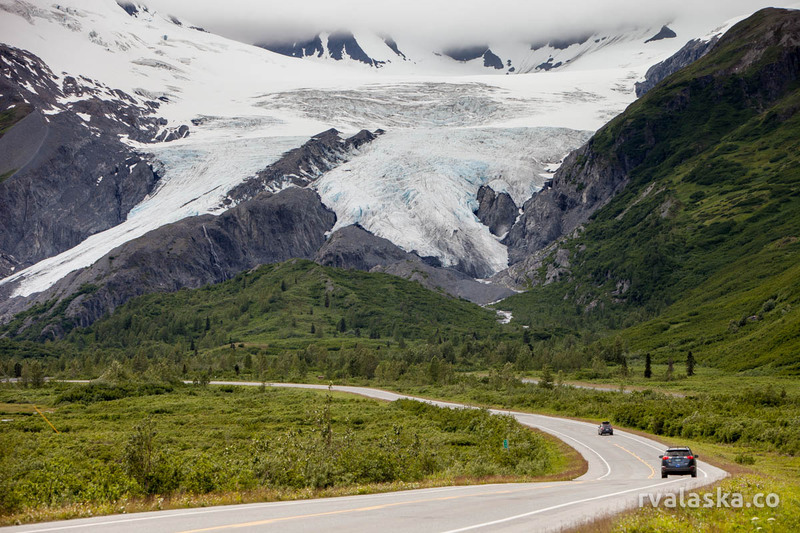 The Wrangell-St. Elias Visitor Center is located on the Richardson Highway, 10 miles south of Glennallen. 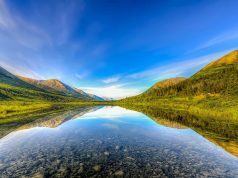 Wrangell-St. Elias National Park and Preserve is America’s largest National Park, encompassing 13.2 million acres. 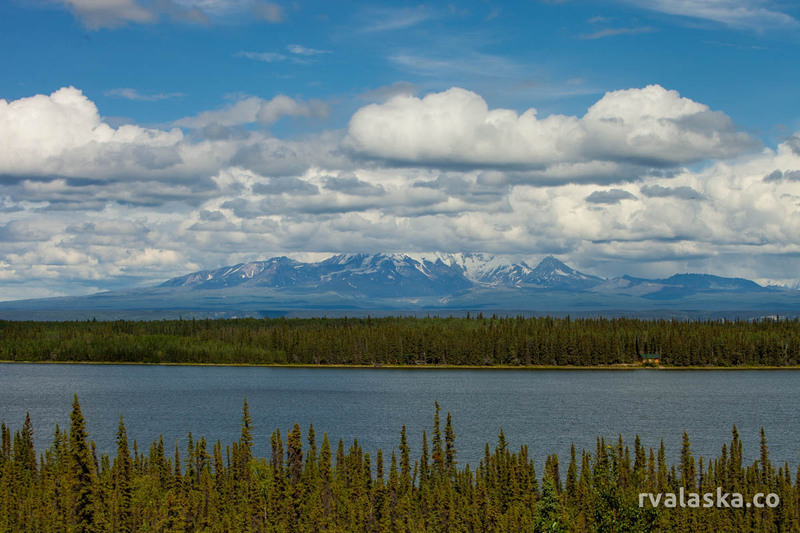 There are plenty of scenic viewpoints on Richardson Highway with a clear view where you can pull out and take photographs. A view of the Chitina River and the Wrangell Mountains just north of the Chitina junction. 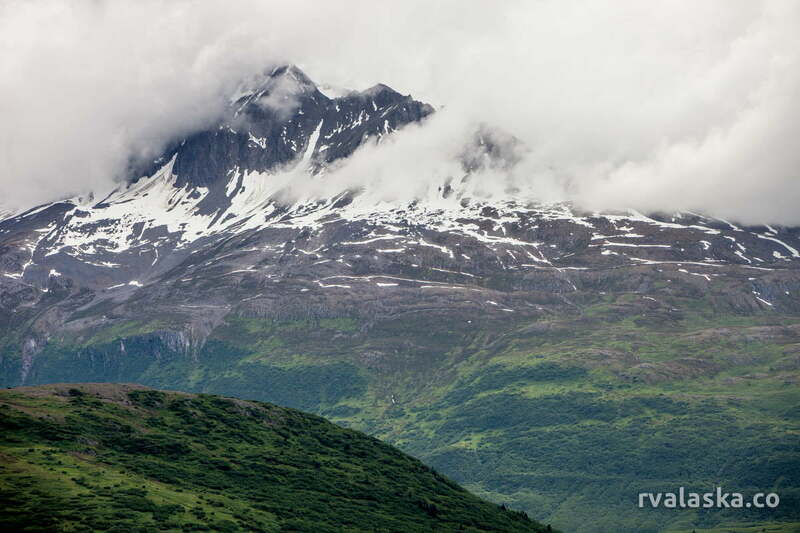 Continuing towards Valdez there are stunning views of the Chugach Mountains and the occasional glimpse of glaciers cascading between the peaks. There are pull-outs with nice views of the Worthington Glacier, one of the most accessible glaciers in Alaska. You can see Worthington Glacier up close at the Worthington Glacier State Recreation Sit, about 30 miles north of Valdez. The Richardson Highway heading south towards Worthington Glacier. Jagged mountain peaks come into as the highway climbs to an elevation of 2678 feet at the Thompson Pass. There is a parking area just past the pass and it’s worth stopping here for a photo, or if your feeling adventurous, an alpine hike. View from the Thompson Pass. Past the Thompson Pass the Richardson highway descends to a plateau where the vegetation becomes extremely lush. In late May, the highway was teeming with wildflowers. 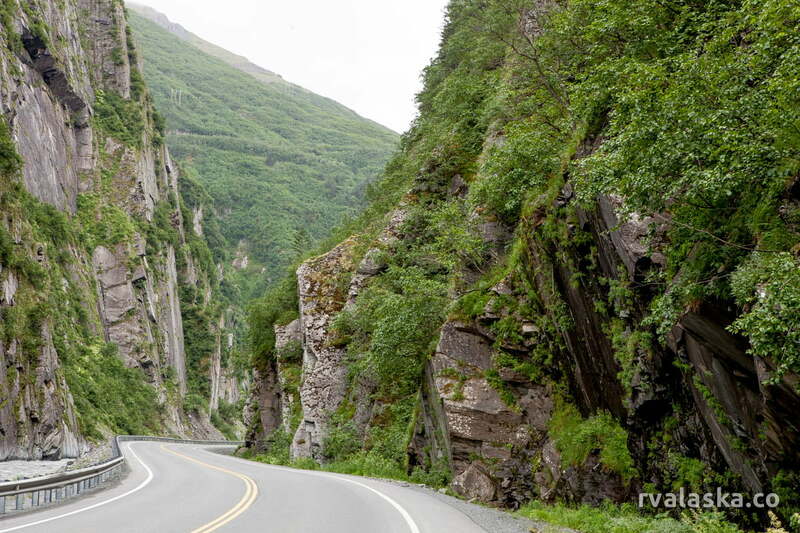 The Richardson Highway winding through Keystone Canyon about 15 miles from Valdez. One of the most impressive parts of the Richardson Highway is the Keystone Canyon, about 15 miles from Valdez. The route winds through tall canyon walls, punctuated by waterfalls emptying into the fast-flowing, chalky blue Lowe River. There are several pull-outs where you can photograph the waterfalls including Bridal Veil Falls and Horsetail Falls. At another spot you can explore an unfinished rail tunnel from the early 1900s when attempts were made to build a railroad through the canyon. Shop line North Harbor Drive in Valdez. 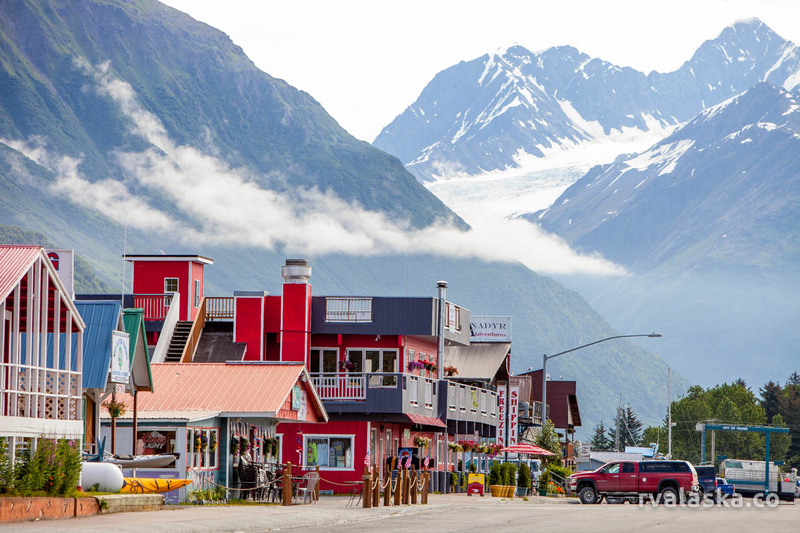 The highway ends at Valdez, a picturesque coastal town with a relaxed feel. The North Harbor Drive is excellent for a seaside stroll. There are shops, restaurants and tour facilities overlooked by glaciers and mountains on one side and a boardwalk along the harbour on the other. 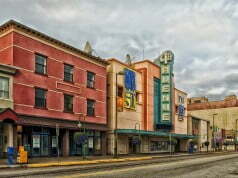 In Valdez you can find many amenities including plenty of RV Parks, campsites, hotels, restaurants and activities. 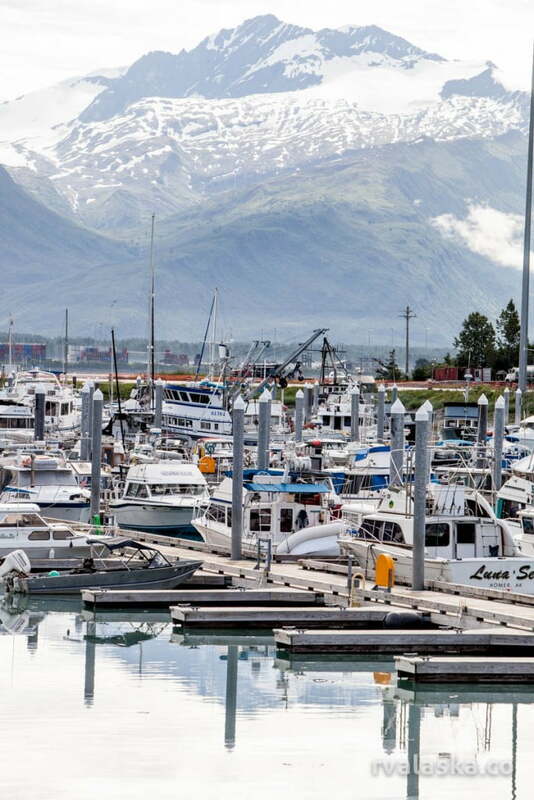 The small boat harbour in Valdez. Valdez is the largest port in Price William Sound, a premier fishing destination. With about 3,000 miles of coastline and 150 glaciers, Prince William Sound is also popular for sightseeing tours.